YOUR COMMUTE TIME IS PRICELESS. SPEND IT THE WAY YOU WANT. Productivity en route isn’t a new concept. Business jet manufacturers have been touting the ability to “get business done” onboard since Learjet took to the skies in the 1950s. But a lot of thought hasn’t been given to productivity between home and the corner office. At least, not really beyond the iPad and blackberry. That’s where veteran coachbuilder Howard Becker leads the industry by leaps and bounds. 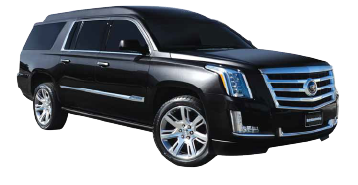 Becker Automotive Design, based in southern California, delivers the category’s most prestigious and well-honed executive transportation worldwide. Nearly two decades in development, Becker picks up where the original manufacturers leave you hanging. 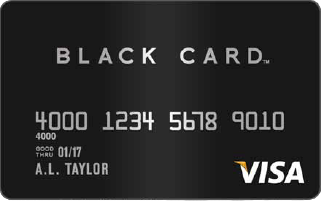 He makes your time on the road more valuable by giving you the options and ability to spend that time exactly how you want. Becker picks up where the original manufacturers leave you hanging. 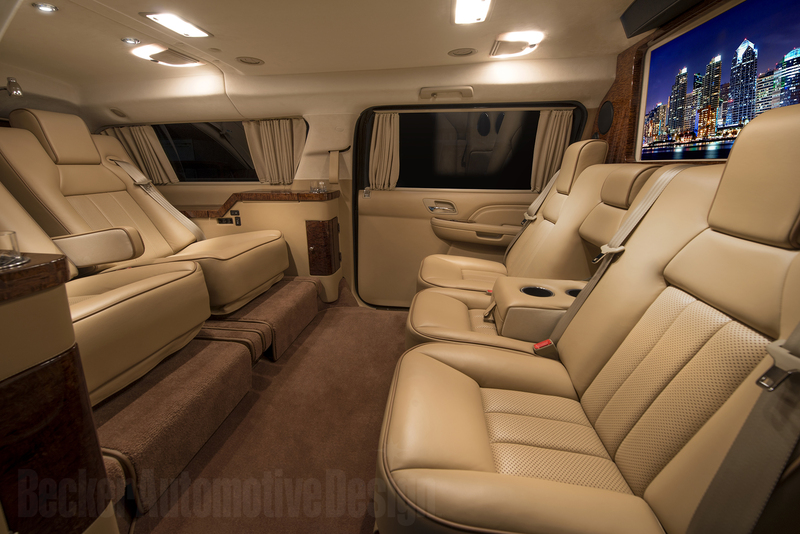 The JetVan exterior is appropriate for today’s high-profile CEOs and princes who prefer discretion to flash. The company also leads in anti-intrusion and bulletproof armoring options–if that’s how you need to roll. However, the significant difference is found on the inside, where Becker has transformed an industry and ignited a bevy of copycats who rarely, if ever, come close to the standards of quality and engineering found in one of these custom conversions. … Becker has transformed an industry and ignited a bevy of copycats who rarely, if ever, come close to the standards of quality and engineering found in one of these custom conversions. 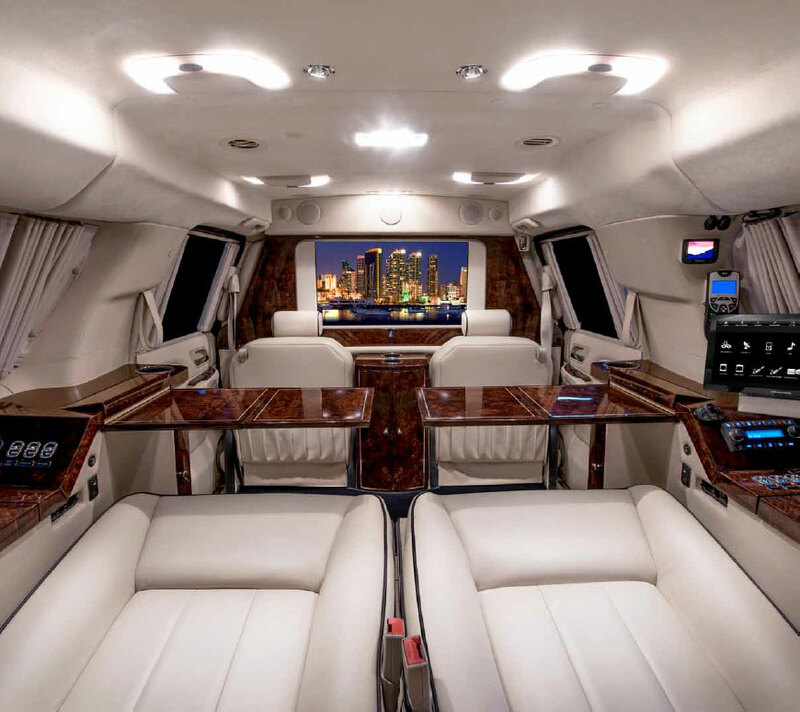 The highest levels of luxury, comfort, personalization and business productivity are key to a Becker JetVan or Becker Cadillac Escalade ESV. The JetVan, a Mercedes-Benz Sprinter platform. The Sprinter platform is ideal for those seeking maximum room and even stand-up comfort. The largest chassis delivers up to 547 cubic feet of boardroom spaciousness. It’s their understated appearance that you’ll notice most when you see this Mercedes-Benz gliding down Pacific Coast Highway in Malibu or Sheikh Zayed Road in Dubai. 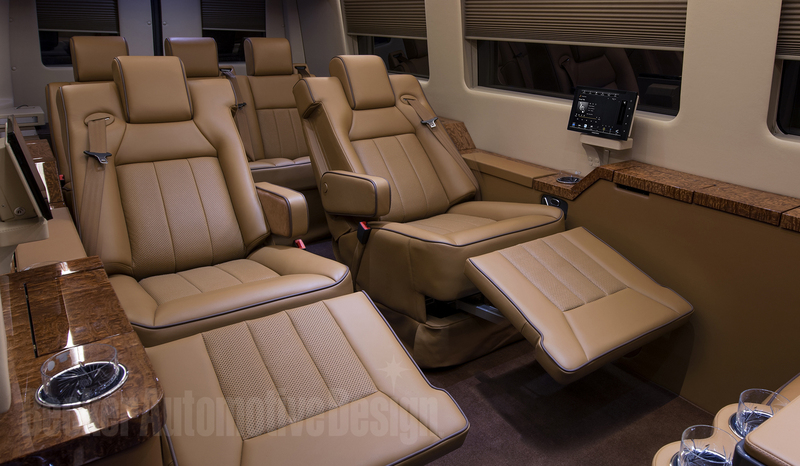 Interior features for your next Becker Cadillac Escalade ESV or JetVan include a full array of the kind of technology not typically found on the road: broadband wireless Internet, 40-inch LED/LCD high-definition monitors, custom sound and lighting, security cameras, computer-controlled cutting-edge infotainment– all conducted from the CEO seat using the same Crestron system that you might see manage your 30 room Beverly Hills estate. Becker’s unique array of advanced technology lies beneath premium surface materials, including the finest leathers, handcrafted (in-house) wood lacquer finishes and custom woven carpets, brushed metal knobs, levers and switches (many sourced from Bentley), and aviation-grade interior lighting–all combined to create a sophisticated jet-like interior in the fast lane. Whether you’re a Saudi prince, a movie mogul or a Fortune 500 CEO, your time is your most valuable asset. 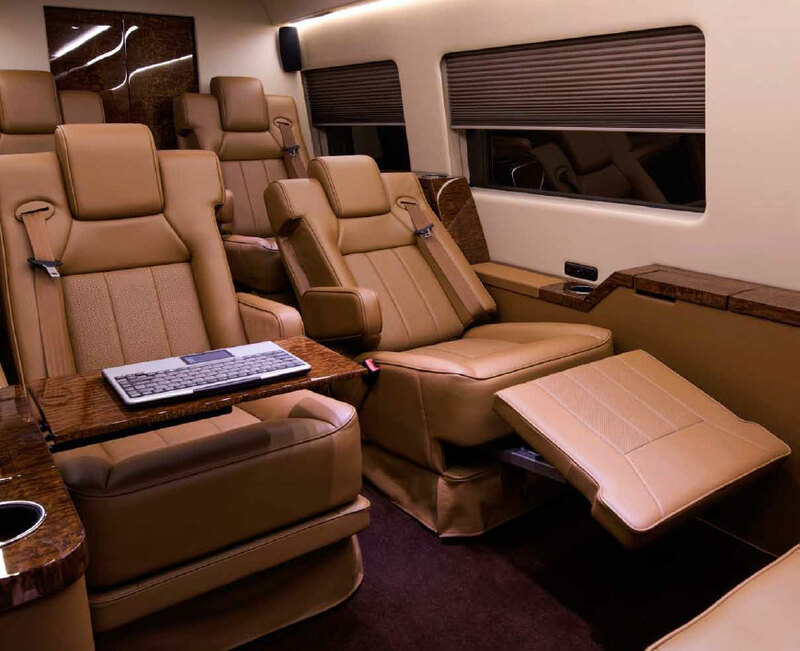 The ability to hold a conference while on the road, exercise on a built-in workout bike in your Cadillac Escalade ESV or just relax cosseted in rare luxury and comfort are what keep Becker Automotive Designs at the forefront of this category and makes a Becker vehicle among the most desired coach options in the world. The conversion cost of a Becker vehicle varies depending on the options and detail you choose. 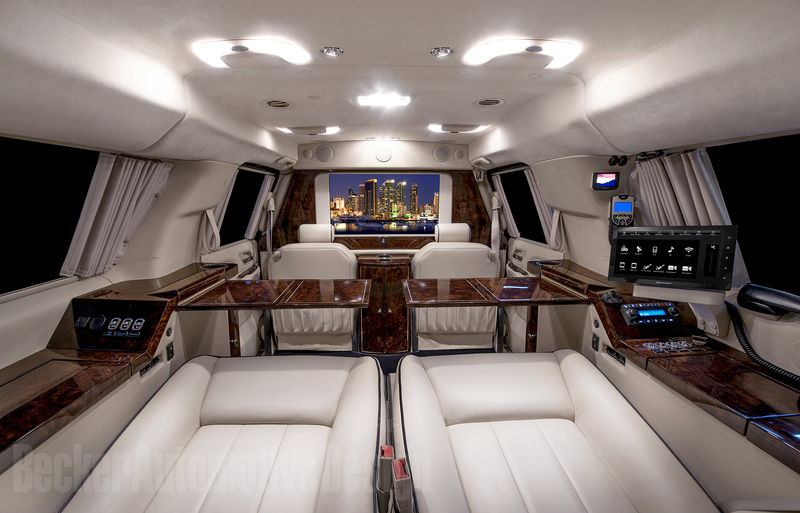 Becker Cadillac Escalade ESV conversions start from around $150,000; the Becker JetVan conversions range from $200,000 to $450,000.